Despite the near-certainty of cancellation, ratings in the cellar and nothing left to lose, the fourth and final season of Star Trek: Enterprise was unanimously hailed as the best. After ending season 3 with a mind-boggling cliffhanger, series creators Rick Berman and Brannon Braga handed show-runner duties to executive producer Manny Coto, who rejuvenated the flagging franchise by bridging the gap between Enterprise and the future developments of Star Trek: The Original Series. By recruiting lifelong Trek experts Mike Sussman and the husband-and-wife team of Judith and Garfield Reeves-Stevens to his writing staff, Coto ensured that political events in the Enterprise timeline would lead to a "coalition of planets," thus forming the Federation cornerstone of Star Trek's future. But first, Coto had to find a way to extract Capt. Archer (Scott Bakula) and his battle-worn crew from an alternate timeline--the result of the continuing Temporal Cold War--in which the Nazis have invaded U.S. soil in 1944. In the normal Enterprise timeline, political upheavals have left relations between Vulcans, Andorians, Tellarites, and Humans in a state of near-disastrous chaos. Into this blazing cauldron of action-adventure, Coto and staff introduced story arcs that connected to Star Trek's future, including a three-episode arc ("Borderland," "Cold Station 12," and "The Augments") in which Dr. Arik Soong (played by Next Generation alumnus Brent Spiner) and his superhuman "Augments" chart a tragic course that would lead, in future generations, to the creation of Spiner's cybernetic NextGen character, Data. "The Forge," "Awakening," and "Kir'Shara" returned T'Pol (Jolene Blalock) to her native Vulcan, where encounters with the legendary philosopher Surak, and zealous sect called the Syrannites, lead to pivotal history with the Vulcan High Command. In subsequent episodes, Phlox (John Billingsley) would discover the reason why some Klingons lack "cranial ridges" (thus solving a vexing Star Trek mystery), and "In a Mirror, Darkly" marked and eventful return to the "Mirror Universe" from the original series episode "Mirror, Mirror," for what Coto aptly describes (in the bonus featurette) as a two-part "romp," complete with a "Mirror Universe" title sequence, the reappearance of the U.S.S. Defiant from the original series episode "The Tholian Web," and a glorious recreation of a "Constitution Class" starship bridge that gave long-time Trekkies a breathtaking rush of nostalgia. In the closing episodes, the formation of the Federation is threatened by a radical xenophobe (Peter Weller) whose isolationist tactics lead Trip (Connor Trinneer) and T'Pol to a future of interspecies parenthood, and while the series-ending "These Are The Voyages..." is considered a disappointment by some, it provided a suitable Next Generation tribute to Star Trek's past, present, and future. Considering the daunting challenge of tying up loose ends while looking forward in a way that demanding fans could appreciate, it's fair to say that Enterprise reached a satisfying conclusion that its cast and crew can be proud of. that science fiction has to offer to the most boring imaginable. The concept of a series taking place shortly after the First Contact Movie is a brilliant idea. But it seems a long way from the idea to realisation. Already at the end of the pilot (Broken Bow) I missed the greatness this concept potentially has. You get thrown into "business as usually" (rescuing, exploring etc.) way too soon. I would have loved a pilot movie plus some more shows describing the time from first contact to the launch of Enterprise. That would have been something truly new. But this pilot is just an extended version of a 08/15-show. The set designers and the costume designers all did a great job (thanks for avoiding more romper suits). But it is difficult when there are too many boring scripts. "Landing on an alien world, been taken prisoner, making an escape." Even the visit to Risa follows this. Also there is "being boarded, been held hostage, chasing away the enemy". Then there are some episodes like "Shuttle pod one". The whole show consists of a rather dry talk between Malcolm and Trip. I can't imagine something more boring. But on the other hand you can't skip those episode - they sometimes contain important information on the characters. Therefore the waiting for the good and outstanding episodes is somewhat painful. These are the shows "The Andorian Incident" (I love the duplicity of the Andorians and there development into the 4th season) , "Shockwave", "First Flight" and the continuing plot about the Xindi (finally a few more star battles than in TOS, TNG and DS9). Then when the series was already near its death the 4th season hit with power. The plot about the Augments could have been an Oscar-winning movie, and so would have been the story about the Vulcan's not been that perfect after all. The Andorians continue to deliver and the racial conflict with "Terra Prime" is the kind of stuff I waited 4 seasons for. Seeing the 4th season there is defiantly potential for three more seasons. But with the experiences of the first two seasons I can't blame the network for discontinuing the show. I bought the slime line boxes and paid for each 13 British Pounds (18 US-Dollar). If I had paid the regular price for the first editions (80 Dollar) I would have been very upset. I was not a fan of Star Trek Enterprise when it was originally broadcast...as a fan of all the other franchises, they sort of lost me during the second season. I did purchase all four seasons and in hindsight, I should have hung in a little longer when the shows were broadcast. Season 3 was much better than Season 2 (the season long story arc was impressive) and Season 4 even better than 3. Standouts included the exploration of the Vulcan and Andorian cultures. The only issue I had with the Fourth Season is that it (and the series) sort of wilted at the end. Rather than having a block-buster ending, the flash back to a number of years after the story really ended (basically giving the run two endings) was anti-climatic. And what happens with Tripp did nothing to enhance the drama of the story - it was like it was an after thought to get ratings or something. 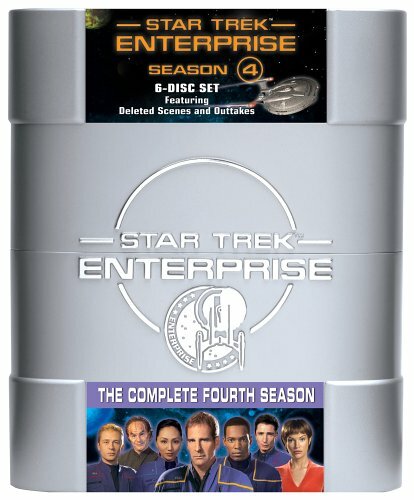 In my huble opinion, the fourth season of Star Trek: Enterprise was perhaps the best. With the changes in the executive production and writing staff that took place, a new and proper tone was taken with this season. The addition of Manny Coto and Garfield and Judith Reeves-Stevens to the creative staff breathed a fresh perspective into the show. Season four provided us with new insights into the Star Trek universe and explained some "rather bothersome" inconsistancies that existed between TOS and TNG (What's up with the Klingons?"). All of the short story archs throughout the season were perfect and in the vein of Gene Roddenberry's vision of the future. Unfortunately, the series ended before it's time. Oh, and by the way, the series finale really wasn't that great; it was more like an exostential piece, that was a throwback ( or is that throw-"forward") to the Next Gen.
Enterprise returned the franchise to reality. In this show the characters are believable and real, the commanders arrive at reasoned and satisfying decisions and the science is refreshingly grounded. Next Generation had gotten itself lost in technobabble and was more a soap opera in space that hard sci-fi. So, if you like your sci-fi gritty and real, then Enterprise is actually the creme of the crop. I really like Scott Bakula as the captain and I've met military commanders who are not a stone's throw from the character he portrays. Kudos for keeping Archer real and not a melodramtic twerp. There's so much I wish could've happened. I could never see any smart woman, let alone vulcan, wasting time on Tripp. Far more likely was a relationship with the captain - we all held our breaths... and it didn't happen! Still, there's no accounting for chemistry is there? So maybe this does, in a way, reflect human relationships. Everyone in this series worked hard and it shows. It is simply sad that after New Gen, Deep Space 9 and Voyager the viewing public was sated on silly space soaps and failed to recognise the true excellence that is Enterprise. Great series - Love it! I am a trekkie and with the purchase of this DVD set, I was just one DVD set short of having all the Star Trek DVDs (including the movies). As for this set, I totally loved it. In a way it made me sad to realize that the show was cancelled so early. In my opinion season 4 was the best (for Star Trek Enterprise) and they could have done so many more story lines. I just hope that they follow up on some of the story lines with movies. It is a bittersweet symphony, this unfortunately, last season of ST - Enterprise. It contains some of the best episodes of the series, but also the worst one of possibly the whole franchise- "These are the Voyages", titled as "Valentine for fans" by the writers, but it was the exact opposite of that, a slap in the face of those who liked Enterprise and its crew as well as the cast. I won't go into detail, this episode may have been average as a stand-alone one in the middle of a season, but as a finale it was just bad. Totally ignoring any character development established in the previous seasons, only a 1-hour finale instead of the established 2-hours, but to bring more insult, bringing in two characters from TNG and delegating Enterprises' own cast to the rank of gueststars. I didn't need a farewell to the whole franchise, I wanted a fair farewell to Enterprise and we didn't get that. As for the rest of the season, it contains gems like "Home", "Demons", "Terra Prime" and the Vulcan-Arc trilogy "The Forge", "The Awakening" and "Kir'Shara". Enterprise was in my opinion the best of all Trek series. While many Trekkers might disagree, I think it was the most human Trek and most suited for the casual viewer, not only the die-hard fan. The DVDs are what you come to expect of Paramount, the extras are okay, but not as generous as the previous seasons, the bloopers are painfully short. Although as expensive as the rest of the bunch , I think it is well worth the money. I wish it wouldn't have been cut short. This season was the best of the Star Trek Enterprise series. Season one was a very good start, but seasons two and three, while good sci-fi, were slightly off genre for Star Trek. The fourth season has shows that fills in the Star Trek Universe and again starts to focus on social sci-fi -- what happens when humans face the strange and unknown, within and between individuals, and the in the universe. Having been a big Trek Fan since my teen years, I am glad that generally, the recent incarnations of Star Trek (especially Deep Space Nine) have had good stories combined with better and more realistic special effects along with the basic trek theme which make it engaging and watcheable. This is the season of the "Star Trek" franchise series that fans have been waiting for. In terms of rich character development, gripping drama (with actual surprises and true tension in the narrative twists), and provocative, funny, and moving writing and direction, Season 4 consistently reaches the heights of the best in the entire Star Trek franchise (only paralleled in the best seasons of The Next Generation, while the original series remains iconic and quite enjoyable). The viewer is truly brought to care about the characters and events depicted in these shows. For fans who may have drifted off while ST:E got derailed by current events during 2 & 3 and most of the fun and originality was sucked from the series, definitely check out this season, because the writers, headed by Manny Coto, truly delivered the attention to detail and understanding of characters that was a hallmark of the best of this series. In addition, the producers and directors showed far better timing and originality in the feel to the show, which demonstrated a spark that had only been hinted at until then. The drive and high quality of the storytelling and the full portrayal and resolution of the universe created through the Trek series leads to a palpable energy throughout the shows. Finally, literally every major cast member was given tremendous material to play off of, and they delivered. In particular, Connor Trinneer as "Trip Tucker" and Linda Park as "Hoshi Sato" really developed tremendously satisfying portrayals of their characters, although the same could be said of Captain Archer, T'Pol, Phlox, and the entire central core of characters. On the other hand, the awful reputation of the finale is well-deserved: it is so poor that one has to wonder what was at the source of the whole affair. Manny Coto and the entire team delivered such a wonderfully brilliant season, and then Braga and Berman return to deliver a poisoned Valentine that is a nearly complete opposite of the entire season. It is not particularly the framing device of Riker and Troi that is the problem here (and for series finales, creators often choose an abrupt shift in format or structure, as was the case with ST:TNG and many other shows), but the awful narrative which makes little sense in terms of the characters and even has a number of utterly incongruous scenes (such as crew members smiling and looking quite satisfied seemingly moments after their colleague and close friend has died!). Not only that, but Braga and Berman demonstrate yet again the most sophomoric and uncreative attempts at injecting drama -- just kill off a character for no reason except to do something that's, well.. dramatic. As a result of the poor writing, the whole affair seems slapped together and as if everyone were distracted and rudderless. (By the way, as much as the presence of Riker and Trio get the blame for this, Frakes delivers a fine performance for a thankless task.) For a franchise that often notes the importance of its fans, its a truly deranged sendoff.